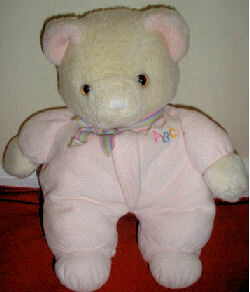 Megan is no longer looking, but we still have a mailing list of people looking for this bear. For the 16 years that I’ve been alive, he has been my “Bear Bear” and my best friend that I slept with, cuddled with, and took absolutely everywhere. I wore him out so badly that you wouldn’t be able to recognize him any more, and I recently lost him when I went on a trip. I am heartbroken and looking for a new one. If you could help me out that would be great. There is one that just completed on eBay for only $7, too bad its no longer available. Thanks for trying, Jamie. At least I was able to get a good photo of the pink version now. I don’t know if it will work for anyone, but I sent the link to the mailing list. Thanks again, Chiara!!!! Thanks, Brieanna. I contacted the mailing list. i have the same bear in blue! his name is blue teddy. (obviously i was an original child.) i was looking to buy another one of him to save so that one day when i have a baby they will have the comfort that i have. i still sleep with him and he’s so worn out. don’t give up looking! I have the blue one and I named him “blue baby” I’ve had him for 23 years. During that time,he has had multiple “surgerys ” (body replacements) to keep him from falling apart. He still has the pads on his feet and the same fur. I love him with all of my heart. I remember going on a trip to Florida when I was little and I put him down at a store and got back to the hotel and realized I had forgot him. My awesome grandma called like every store in Florida looking for him. And I’ll never forget what the cashier said when we finally found him. “Yes I spotted it left on the table, it looked very well loved”. Thank you for letting me share my story! I hope you can find one! !